A great handheld snack for any occasion ! Pre-heat the oven to 375 degrees. Take a rimmed baking sheet out and line it with aluminum foil. Take a large skillet out and set the heat to medium. Once the skillet’s hot, add in the Italian sausage, ½ cup of the pepperoni, and the minced onion, stirring now and then for 7 minutes or however long it takes for the sausage to be fully cooked and crumbly. Drain off the grease afterwards. Add the cream cheese and pizza sauce to the skillet, stirring until the cream cheese has melted and the mixture looks smooth. Take the skillet off the heat. Spoon the skillet mixture into the mushroom caps (keeping the filling even with the top of the mushroom or maybe a little over) and place it on the lined baking sheet. After filling the caps, sprinkle the mozzarella cheese and what’s left of the pepperoni over the top and stick the sheet in the oven. 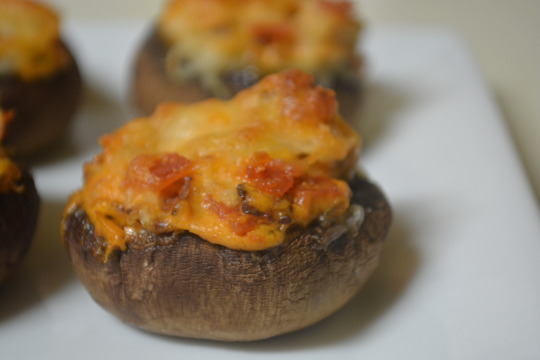 Let the mushrooms cook for 20 minutes or until the cheese looks golden brown (20 minutes worked for us). Serve right away (we found if you let them cool down a little before eating them, they’re a lot more enjoyable). If you eat them right after they’re done cooking, you’ll have the water from the mushroom come squirting out and it dilutes the flavors to the point of it just tasting “meh” but if you let the mushrooms cool down a little so the juice doesn’t come bursting out when you take a bite, that’s when you can really taste the flavors of the filling. Using hot Italian sausage adds just a little bit of heat that wouldn’t have been existent in the dish otherwise. The Italian sausage and pepperoni adds some texture to the dish, the cream cheese provides a creamy tanginess and the pizza sauce adds a little sweetness. We got this recipe from a Cooking with Paula Deen magazine. We weren’t paid in any form to promote the Paula Deen magazine.